If I had enough coffee and chocolate I could rule the world! Ok maybe not but they are staples in my busy life as a mom, wife, blogger, domestic engineer, chauffer, cook, maid, the list goes on. 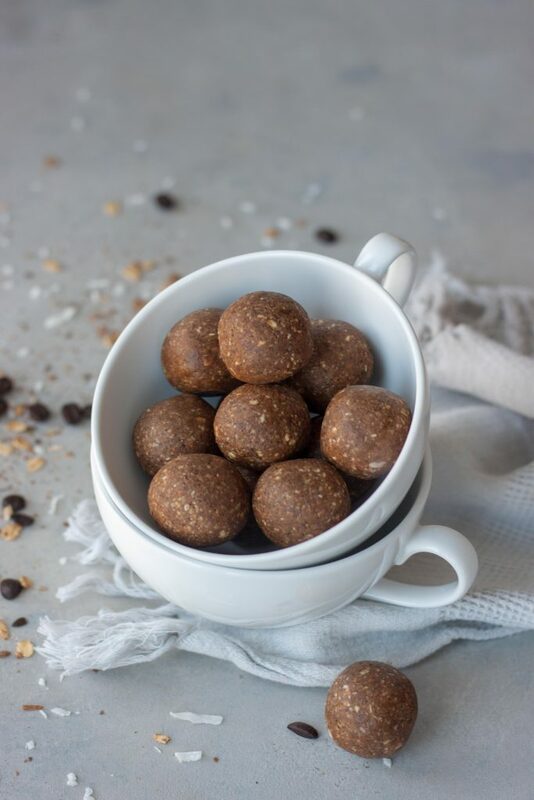 Lately I’ve had a staple secret snack that I know you’re going to love as much as I do, Cocoa & Coffee Coconut Bliss Bites! I have about 2 a day, pre-workout and always one in the afternoon with coffee or a matcha latte on the way to get the girls from school before taking them to all their activities. 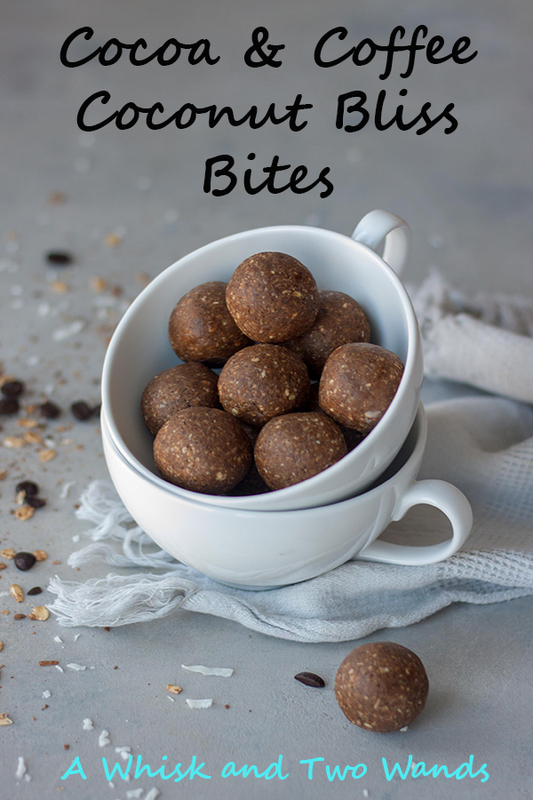 Quick and easy snack bites that are a cross between a fat ball and energy bite and only require 5 simple ingredients these little bites of heaven that keep me fueled and focused! 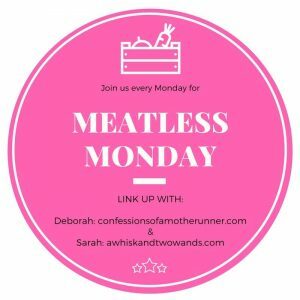 More if you want to add in adaptogens, superfoods, or collagen. I added notes for these as I like to add them. They are super simple to make and you can make batches of them to keep in the fridge or freezer. 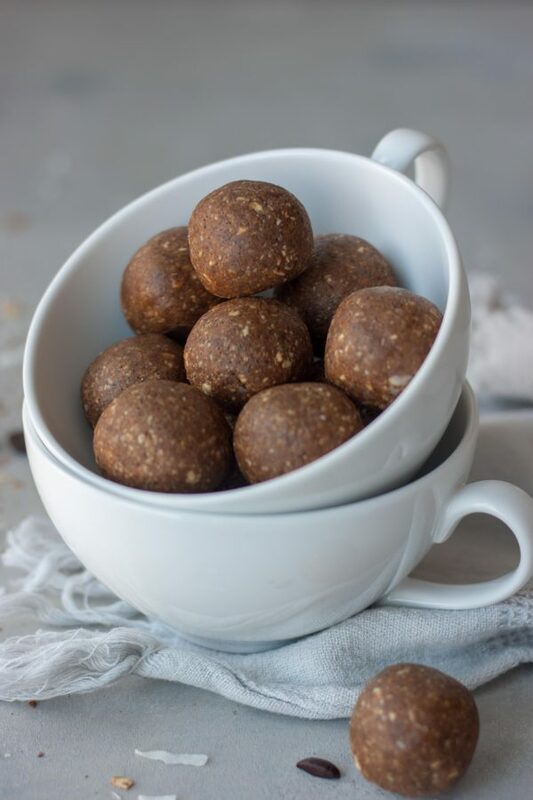 I like to have a batch with maca on hand for pre-workout and then a batch with ashwaghanda or reishi for the afternoon. I also add coop of collagen and Bulletproof Brain Octane. However you can make them simple without these using staple ingredients, muesli, coconut butter, liquid sweetener like honey or agave, ground espresso, and coconut oil. Don’t get worried about the coconut butter you can make it in less then 10 minutes using just a bag of unsweetened shredded coconut! No need to spend $$ on a jar of coconut butter. If you don’t like coffee, I can’t wrap my head around this being a coffee lover but we don’t all like the same thing so I get it and there’s nothing wrong with that! You can omit the ground espresso. Want a little more chocolate you can even add cacao powder, although these aren’t too sweet but you can also add a little more sweetener if desired. That’s the best part of making your own bliss bites! Unfortunately I’m fresh out of Cocoa & Coffee Coconut Bliss Bites eating the last one this weekend and hopefully get up early enough today to make more before we head out to do something fun. The girls and hubby are off for Presidents Day and we are going to go sledding or ice skating with friends, depending on weather or find something else fun to do. Otherwise I’ll be making them tonight so I have them on hand this week. Poor planning on my part with the busy week we had last week and I thought I had extras. Then we had a full weekend and I was kicking myself as we drove across town from one thing to another and I didn’t have any before hot yoga with my oldest daughter S yesterday. Luckily I had one of my favorite Go Macro Bars. What are your favorite staple snacks for on the go? In a food processor pulse muesli to a course flour texture. Pulse in espresso and any optional dry additions to incorporate. Add in coconut butter, liquid sweetener, and oil and blend until it comes together adding the additional liquid as needed. You want them to be a little sticky and moldable. Roll into 15 balls, slightly smaller then a golf ball. Store in the refrigerator for 30 minutes before enjoying. Place in an airtight container in the refrigerator until ready to enjoy as they are best chilled. Or for longer storage (longer then a week) store in the freezer where they will keep for a month (there is no way they will last that long) and remove 5 minutes before enjoying so they can soften. To make your own coconut butter just blend an 8oz bag of unsweetened shredded coconut in a food processor or Vitamix, in a Vitamix it takes maybe 5 minutes, food processor a little longer. An 8oz bag will be enough for 2 batches plus a little bit extra. I've played with this recipe as my original Blueberry Bliss Bites started with 1 1/2 cups and for whatever reason these are far too dry with that much muesli. If using another recipe you might need somewhere in between 1 and 1 1/2 cups. 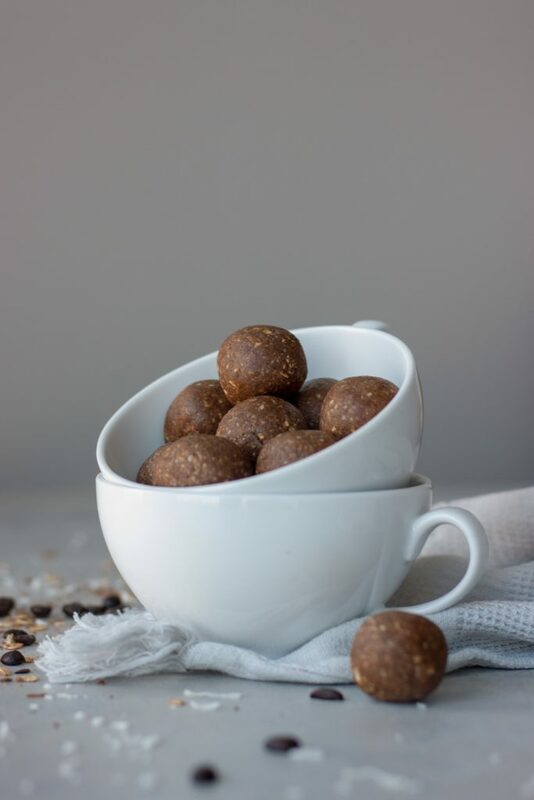 As written and using additional coffee (or other liquid) you can add in a powdered adaptogens and superfoods like my favorite maca, ashwaghanda, or reishi. I've added just over a tablespoon total. A scoop of collagen also works. If adding in more or they are too dry to roll add more coconut butter over more liquid if you've already added 2 tablespoons. I like to have a batch with maca (Navitas) for pre-workout and then ashwaghanda or reishi for the afternoon, and a scoop of collagen (Vital Proteins) to both. I also add Bulletproof Brain Octane. You can add cacao if you want a little more chocolate flavor or even a tablespoon of chocolate chips/chopped chocolate. I really think I might make these. I’m not a coffee drinker. Instead I’m going to substitute the espresso with green matcha powder. Hopefully just as tasty and heart healthy. The original version, linked in the recipe notes, are blueberry and you might like those better. Otherwise you can omit the coffee or add some cacao/cocoa powder! I so have a version like these, no muesli, and matcha I believe posted. Keep me posted if you try these with matcha, I bet the combination would be delicious! It seemed to go through a big phase in jars I think but it’s so easy to make. If you like coconut you’ll have to whip some up! Yum! The coconut and chocolate sounds yummy! omg, you had me a chocolate, coffee, and coconut!